The workshop scheduled for the 19th was cancelled in order that members could go to the aid of another member. Frank, our past Chairman, has some bonsai he has lovingly tended over many years. Being one of our more senior members and now having to cope with various health issues, he was needing some help. After the Winter period, a busy period for enthusiasts, his trees required sorting out and tidying up in preparation for up and coming shows. Several members went to Frank’s aid and lifted his spirits. Nice to meet up with you again Frank and take care. It was a pleasure to be able to help. The Members’ Workshop that should have been held on this date will be rescheduled, so watch this space. Sorry for the short notice, but due to unforeseen circumstances we have to cancel the Landscape Planting Workshop which was planned for this Sunday, 19. April 2015. We will try and rearrange this for a later date. For those members who attended the meeting in February and made pots under the guidance of Steve Kitchman from China Mist Potteries, Mike will be receiving delivery of the pots this Sunday at the Bonsai Traders Ryton-on-Dunsmore Show, Coventry. They will be brought to the May Branch Meeting for collection and, hopefully, a picture taken with your finished pots. It was a good turnout for the Wiring Junipers and Repotting Pines Club Meeting. 14 members attended with their trees, equipment and materials. All available working space was taken up and the room felt very full and industrious as we were either watching Mike explain various techniques on assorted trees or were busily occupied to accomplish as much work possible in the time available. A very popular evening and with Spring now upon us and trees coming out of their winter slumber, it is going to become a busy time and members are keen to be working on their bonsai and shaping the future. A further interest that developed in the evening was the discovery that we have a developing potter in our midst. Trevor has taken up the craft and is on a course and attends a workshop. He brought along some examples of his work and all agreed they were good bonsai pots. Trevor says he is developing techniques with clay, glazes and different firing methods and it is still early days for him. We eagerly await our Swap Shop/Bring & Buy event in July as there will be a queue for Trevor’s pots. Well done Trevor, and can we have some pictures please. Sun,19 April is our members’ next Workshop day when we shall be tackling a new project – Chinese Elm Landscaping. For those attending, you are reminded that you will need 3, 5 or 7 Chinese Elm trees of varying sizes and shapes, potting soil, a suitable shallow pot or slab, any rocks and moss you want to enhance the planting, plus mesh, wire and tools. A host home is still required and Carol will email the details as soon as confirmed. Don’t forget to bring your lunch as well. Contact Mike asap if you need trees for this project. Next branch meeting is Tues, 5 May when we shall be tackling a follow-up to the Group Planting Workshop undertaken in March 2014. Bring along your previous projects for tidying up or materials etc for tackling a new group planting. 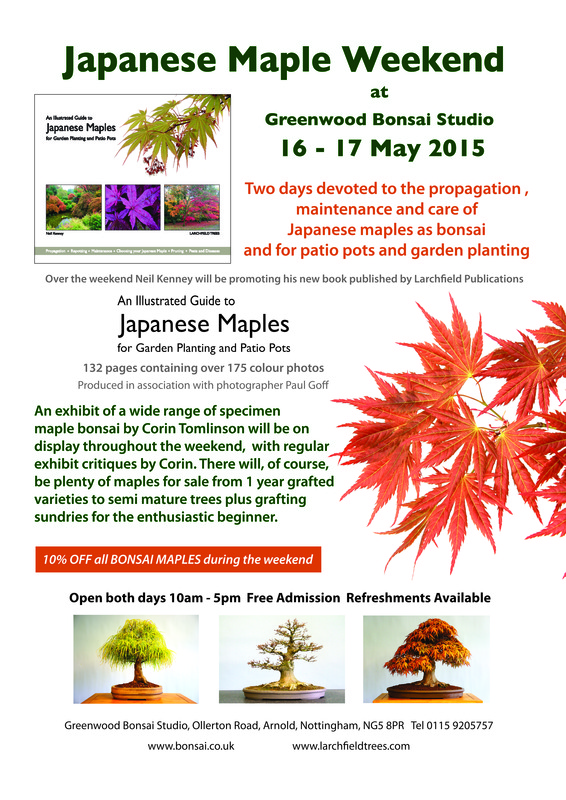 Greenwood Bonsai Studio are hosting a weekend for anyone who likes Maples, both as garden trees and Bonsai.